I suppose we'll give this another go. However, with the recent dismal offering except for CCR and F, can we even bother about keeping track of the other lounges and cabins? GF last week was a sad sight. 3 rather average new world reds and 3 equally poor whites. Not even a basic Chablis. At least First hasn't been entirely enhanced. Whites: 2014 Meursault Bouchard Pere et Fils. Cheninsolite 2014 Anjou Blanc (sweet). 2015 Pinot Gris, Oregon USA. Please update and edit OP as libations change. Well done for resurrecting this thread. Like you I don't hold out much hope for the F Lounge. But let's see. Though early reports from Gatwick aren't exactly encouraging. The Rose on the other hand was rank. I'll stick with the LPGS thank you. Let's let the French make the wine and the UK make the ales and malt whiskey. Each to their own etc, but I wouldn't dismiss English sparkling wines, made by méthode champenoise. Nyetimber, from Sussex, frequently wins international 'Champagne' awards, over the best that the French put up. Give it a try sometime - it is superb IMHO. I have no reason to doubt that Bolney is also good, from a similar district to Nyetimber. I'd be very happy if BA would serve Nyetimber instead of Castelnau. 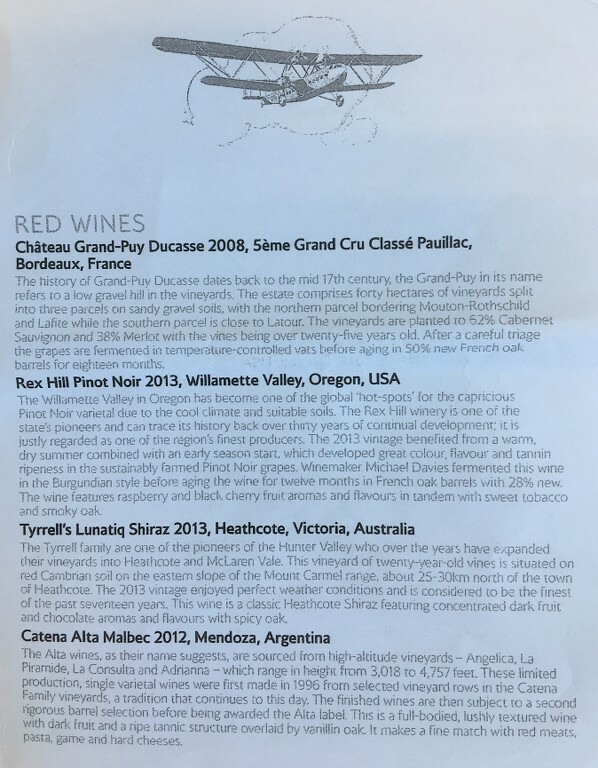 ... About time British Airways have a British Wine on the menu. I think they have once. Wasn't Balfour Rosé served in First a few years back? Or have too many glasses of wine at lunch clouded my memory? Done (by one of my mod colleagues). 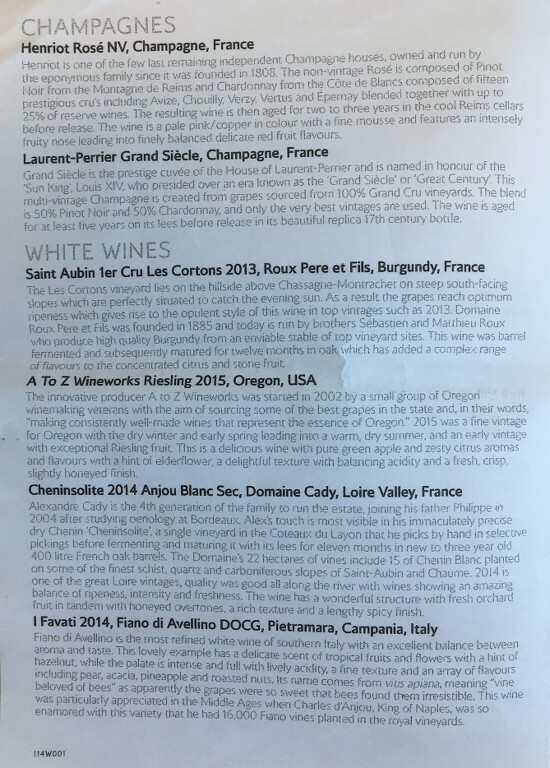 The red wine list is spectacular! Have to be back in CCR soon. and the UK make the ales and malt whiskey. Well, I for one wouldn't mind some of the top Japanese whiskies. When talking Scottish miracles, I certainly wouldn't mind BA putting their hands on some of the few remaining stocks of Port Ellen and serving to us, but the whiskies they are currently offering are totally uninteresting, even in F.
always happy to see anyone doing their own thing. The current English sparkler is good and can hold its own with some of the special club champagne. Sometimes it pays to look beyond the stereotype and work on the taste not the label. LHR T5 GF last week. A pretty sad bunch of whites. The Soave was the pick of the bunch. I'm really not keen on the Henriot champagne. And for the first time ever the chicken curry off the menu was really unpleasant. All rather disappointing. I then flew to Doha where I am sorry to report that the whites in the Al Mourjan business lounge were - Billecart-Salmon Brut excepted - even worse. I drank red Margaux. Well, I say 'drank', but the first two glasses from two different bottles were corked. I gave up and had a gin and tonic. It was Beefeater. So the grass isn't always greener. Perhaps I should just give up drinking?